I am choosing a lot of fiction in the last while for this, but that’s the way the cards are falling. Today’s choice might seem, initially, to be especially inappropriate: a zombie horror novel? One who seems to be most popularly known nowadays through a middling Brad Pitt action film adaptation? But World War Z really does contain a whole host of things within its pages that mark it out as more than the bargain basement level entertainment it might appear to be. In the aftermath of a devastating plague that has nearly wiped out the human race, an anonymous narrator travels the world interviewing survivors, recording their varied experiences with the undead menace and documenting the many ways that everyday life has changed. Obviously Max Brooks, like anyone who has done anything with zombies in the past few decades, took some influence from the films of George A. Romero. And that shows throughout his prose. But, lesser known is his other, and perhaps greater, inspiration: a collection of firsthand accounts from veterans of the Second World War, gathered by Pulitzer Prise winning author Studs Terkel, entitled The Good War: An Oral History Of World War II. Released in 1984, the book is one of the benchmarks of war reporting and dealing with primary sources, the kind of book that I could easily have chosen to talk about today instead. But it is its malformed and altogether odd offspring that managed to captivate my attention to a greater extent. 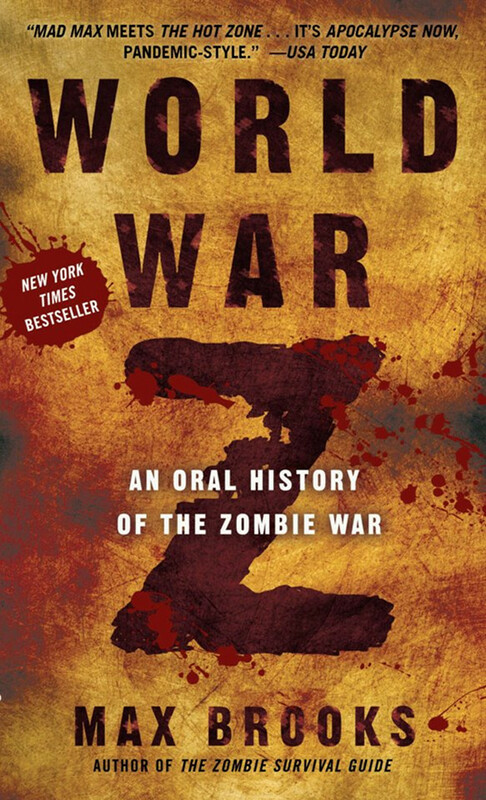 World War Z is a book about shuffling undead horrors that desire to feast on the living. It’s method of relating its story is fairly unique for the genre, eschewing a traditional story in favour of something far grander, of trying to create a complete global picture of the zombie apocalypse as we envision it today, and how the world and its people would realistically react, from Presidents to peasants. The prose and narrative is outstanding, and the book never loses anything because of the loftier tale it tries to tell, where individual characters come and go rapidly and the larger “story” is one more akin to a documentary about a war fought long ago. The interview style and the sudden arrival and departure of those speaking all help to ground this fantastical yarn in a way that makes the effort readable and relatable. But it is also a book about other things. Primarily, in regards this post series anyway, it is about the fluid nature of “Revolutions in Military Affairs” or “RMA’s” that I have previously talked about a bit here. To put it in much blunter terms, World War Z is about learning to fight a new war, from a position where everything that you know about military life has gone up in smoke. From the siege defenders having to suddenly consider cannon to the American Marines trying to adapt to IED’s, various civilisations and eras have had to adjust and change in the face of enemy advancement and alteration of tactics. World War Z is an extreme, but rather unforgettable example of such change having to take place. The enemy in this case is one without large strategic goals, unpredictability or any kind of communication faculty, but they do have overriding mass and the ability to increase their own numbers every time they kill a human. Their origin remains a mystery for the most part and, as with most zombie fiction, the undead act more as a cipher for discussing how we deal with death and calamity. The militaries of the modern world are ones focused on manoeuvre and technological superiority, and find themselves brutally unsuited for the kind of combat they suddenly must engage in. As much as anything else, World War Z is also a story of command incompetence, at a military and administrative level, and while events like the “Battle of Yonkers” might be exaggerated and a tad unbelievable, parts of them, like the obsession with visuals, a lack of planning and an absence of cool, calm and capable leadership, all ring alarmingly true, especially after things like the Iraq War. The result is a catastrophe here, and a gigantic rebuilding operation being necessary. This is a very weird and unexpected RMA – I suppose they all are, to the people who go through them – and World War Z confounds expectations by its depiction of a world where the past becomes the inspiration for how to survive into the future. Napoleonic tactics of massing firepower and formations come back into practise, in order to engage with an enemy that has no grasp of tactics or movement. The psychological and logistical battles are as important as the actual pulling of triggers: there has to be mental well-being and a plethora of ammunition for soldiers expected to mow down wave after wave of rotting human flesh. This devolution is unlikely and a little absurd if you cannot move past the premise, but Brooks wasn’t writing a book about military advancement. In a way that is enjoyable and striking, Brooks’ world and situation gives us a proper bird’s eye view on an RMA situation by presenting something so unlikely. We have to feel like everything that we know about war is wrong and has to change, just as those who dealt with gunpowder or automatic weaponry for the first time must have felt. World War Z accomplishes that. And in that struggle, as the human race comes back from near extinction and vows to retake their lost homelands, comes World War Z’s depiction of total war, in a manner that attaches the book most closely to Terkel’s The Good War. In the 1940’s, all of America had to mobilise to face down the fascist threat: here, the situation is even more dire and dangerous. World War Z is a frank depiction of a world on the brink of sliding into an inescapable anarchy, where vast and unimagined changes in society, politics law and order have to take place. Traditionally in a war, each side and their population have limits: in this scenario, only one side has that problem to deal with, and the quest to keep that limit from being reached forms the backbone of Brooks’ narrative. The entirety of all possible resources have to be thrown at both the enemy and the quest for survival: gigantic swaths of the population are deliberately left to “distract” the undead so others can escape, abandoned children turn feral, women become little more than breeding machines in some places, entire countries disappear into underground bunkers and everywhere, everyone has to contemplate an approaching end point, where the undead shall destroy the living. It might seem flippant to talk about a sci-fi/horror book in such terms, but it is the very extremeness of the setting that makes the lesson sink in as far as it does. World War Z also has the time, through its rich and diverse format, to offer commentary on a variety of other issues. The human race is show as both capable of coming together and pulling each other apart in equal measure: the combined international attempt to rid the world of the “Zed” threat comes after Chinese Civil Wars, false cures and a whole load of homo homini lupus. Usually, one must attempt to dehumanise an enemy if he/she is going to try and kill them: here, that process is already fulfilled, and instead the problem is trying to humanise the remaining people you might once have despised, be it because of political, cultural or religious differences, because now it is a case of all of us standing together or all of us getting killed off. There’s an inspiring message in there somewhere, but it comes with a lot of darkness clinging on. World War Z accurately, in my eyes, depicts and warns against the overwhelming power of panic, that can turn people against each other and cause of downfall of established structures faster than any bomb or bullet. And, in settings as diverse as divided Palestine, shadowy North Korea, and the catacombs of Paris, it depicts a world where the fragile bubble of international relations and cooperation can turn on a dime. So, what did World War Z teach me about war? It taught me, in an extreme (but entertaining) way about how the nature of war can rapidly change from era to era, and how the lessons of the last conflict might be meaningless when it comes to the next. It taught me about the inevitability of mistakes, problems and disasters, and that the true test of an armed force comes in how they deal with the appearance of those things, and not in what happens before. It taught me that international cooperation on a grand scale, between people and nations, can only occur in moments of genuine crisis and peril, where populations and states find themselves on the brink of a disaster. It taught me a bit on how people live with the things that they have done in war. And it taught me that, even if it is a fictional world, that a spirit of co-dependence and humanitarian assistance can work miracles, and may be the only thing that prevents mankind from destroying itself. It probably won’t be zombies that form the next great threat to world security, but something will come up. World War Z paints a picture of a terrible fall, but hope remains from the resulting rise. This entry was posted in Books, NFB Reading List, Reviews, War and tagged books, max brooks, nfb reading list, reviews, rma, the good war, war, world war z. Bookmark the permalink.